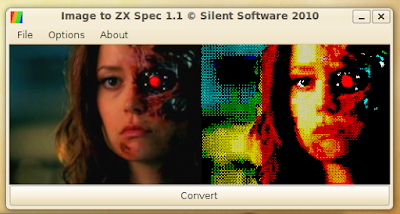 Image to ZX Spec 1.1 is now freely available. You can use Image to ZX Spec 1.1 online here (requires Java 6) or choose to download it. and one of 15(!) 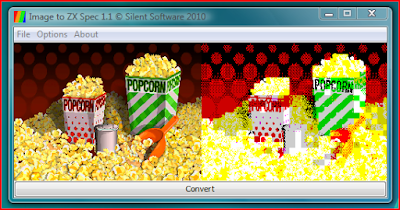 dithering modes (shading for the non techies). - Choose from numerous processing options as to how the images will be converted. - Added new Atrribute Favoritism feature to choose the colour set to use (greatly improves default image quality). - Added Dither Preview feature which displays previews with different dithering algorithms (and takes advantage of multi core processors). - Updated BASIC slideshow program with new warning to stop tape. - Minor bug fixes to do with image conversion colour choice. - Memory usage increased for larger image conversion (512MB min). - Main frame has splash picture, About box displays system info. Online version: >256MB memory free (image size limited). Standalone version: >512MB memory free (larger image sizes permitted). Many thanks to Viperfang Networks for the hosting. I'm currently toying with dithvide mode, avi conversion and true multi core multi image processing so it's unlikely I'd be doing this soon.